Oversize softcover 10 1/4 x 13 3/4 Lassen Publishing, Maui, June 1993 FIRST EDITION . 182 pages. Color reproductions throughout... a real feast for the eyes! Clean and tight with mild corner bend, upturn, minor scratches to glossy surface, mild edge wear, mild bump top/bottom spine. "Leading a revolution to save a dying planet is artist Christian Riese Lassen, whose unique approach to pigment, light, and movement has produced the most thought-provoking--and sought-after--marine and environmental paintings the art world has ever seen. " " Visualize the swell of a wave and its transluscent color; a flaming sunset on the horizon or the moon reflected on the ocean's surface; the endless variations created by the surge and pull of the tide. See dolphins and whales, reef fish, and the amazing panorama of underwater life. 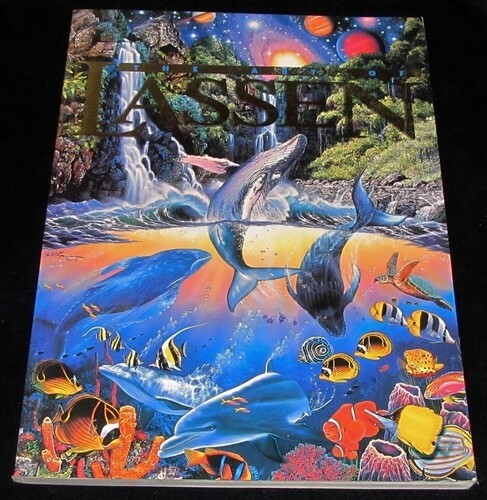 These are some of the wonders that Christian Riese Lassen is world-renowned for recreating in his magnificent art." It includes many of his triptychs in fold-out display.